circuitbreakerservice has no other items for sale. Product: HBL8310I. 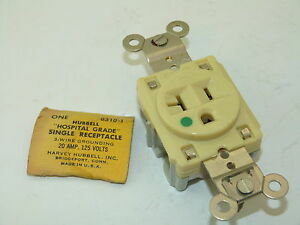 HUBBELL SGL RCPT NEMA5-20R. We no longer accept checks or Discover card. (Improper installation, usage or abuse voids any warranty). A RGA must be requested and approved. Sales tax may apply when shipping to: CA(7.88%), IA*, MN*, WA*.